Designed by Donald Steel and inaugurated in 2004, Santo Estêvão is located in the municipality of Benavente, in a totally preserved rural area. Perfectly integrated in the natural environment, this field has a unique landscape, where cork oaks and large spaces give the countryside an uniquely Portuguese environment, a testimony to the exploitation of cork and livestock that characterize the region. Santo Estêvão Golfe is located very close to Ribagolfe, approximately 40 minutes away from Lisbon. 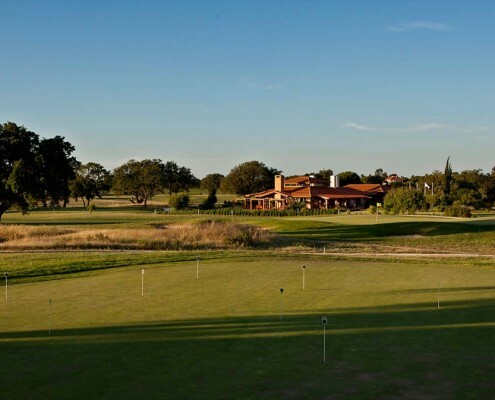 In the fertile rolling lands of the northern Alentejo, stretched over 72 hectares, the Santo Estevao golf course has ample room to take advantage of wide fairways and open wooded countryside. With carefully designed greens and bunkers, the gently undulating land is ideal for golf and makes an easy, pleasant walk throughout the golf course. Conditions around the greens allow players to choose the best recovery shot, from low chip to high pitches. The first whole quietly and easily introduces the golfer to the Santo Estevao golf course, near Lisbon. 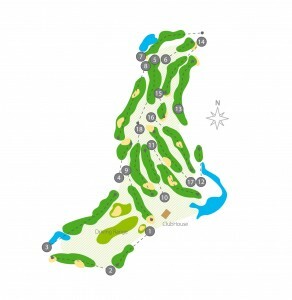 However, by the 8th hole the player will find that the game has changed introducing more skill with teasing greens. The 11th hole, Par 4, with an outstanding view of the golf resort big lake, is the most attractive on the course and at the same time the most challenging to play well.